Benjamin Géza Affleck-Boldt (born August 15, 1972) is an American actor, movie director, producer and screenwriter. He became well known in the late 1990s, after acting in the movie Good Will Hunting. He has since become a Hollywood star having acted in several movies. Affleck began playing the role of Batman in the DC Extended Universe beginning with the 2016 movie Batman v Superman: Dawn of Justice. He later played Batman again in Suicide Squad and will appear Justice League and in his own solo movie The Batman (2019). Affleck was born in Berkeley, California and grew up in Cambridge, Massachusetts. His mother, Christine Anne "Chris" Affleck (née Boldt), was a school district employee and teacher. 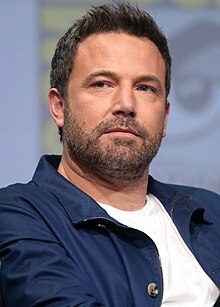 His father, Timothy Byers Affleck, has been a drug counselor, social worker, janitor, auto mechanic, bartender, writer, director, and actor with the Theater Company of Boston. Affleck's mother was a freedom rider in the 1960s; until her retirement, she was a public school teacher in Cambridge, Massachusetts. His younger brother is actor Casey Affleck. He has English, Irish, Scottish, German, Swedish, Swiss, Northern Irish (Scots-Irish), Welsh and French ancestry. The surname "Affleck" is of Scottish origin, and his middle name, "Géza", was the name of a family friend. He was raised in a mostly Episcopalian family. ↑ "Ben Affleck Biography". People magazine. Retrieved 2 January 2013. ↑ "Ben Affleck Biography (1972-)". Film reference. Retrieved 2014-01-09. ↑ "Casey Affleck Biography (1975-)". Film Reference. Retrieved 2014-01-09. ↑ Stephen Dalton (2012-12-31). "Once considered a flash in the pan, Ben Affleck is on the comeback trail - The National". Thenational.ae. Retrieved 2014-01-09. ↑ "Mrs. Shaw was also the grandmother of Hollywood actors Ben and Casey Affleck". Pqasb.pqarchiver.com. 2003-02-10. Retrieved 2014-01-09. ↑ "THR Cover: Confessions of Ben Affleck". The Hollywood Reporter. 2011-11-17. Retrieved 2014-01-09. ↑ "With new film, Affleck ties Boston knot tighter - The Boston Globe". Boston.com. 2010-09-15. Retrieved 2014-01-09. ↑ Heyes, Rebecca. "10 Things About... Batman star Ben Affleck". Digital Spy. ↑ McGee, Celia (December 18, 2003). "Wild about Jen; Ben Opens Up to our Celia McGee". Daily News. New York. Retrieved 2014-01-09.